Zweibrücken, 23 April 2014 - As of this year John Deere’s largest S-Series combines – the 540hp S680, 570hp S685, 617hp S690 and their respective ‘i’ versions for the European and CIS markets – are being produced in Zweibrücken, Germany. “We already have 50 years of experience in combine production for European and overseas markets and have invested approximately 20 million euros in our assembly facilities, infrastructure and quality assurance,” says factory manager Ralf Gaa. 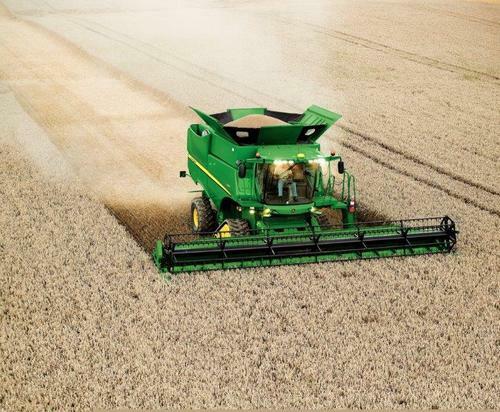 Equipped with a grain tank capacity of up to 14,100 litres, John Deere’s large horsepower S-Series combines feature a single tine rotor and have been designed to provide maximum performance and excellent grain and straw quality. Their highly flexible residue management system meets a variety of harvest requirements. Complementing the wide range of existing John Deere cutting platforms for combines, the new, versatile 600X header with extendable cutterbar will be available in limited quantities and countries for the 2014 harvest. S-Series combines are also available with a number of intelligent solutions, including the new interactive combine adjustment (ICA). Designed to minimise losses and maximise both grain and straw quality, ICA offers the operator a choice of several harvesting strategies and either single or multiple optimisation targets. To further enhance machine and fleet performance, John Deere S-Series combines can be fitted with JDLink telematics and Machine Sync harvesting logistics systems, both elements of the John Deere FarmSight strategy. In addition, John Deere’s GoHarvest mobile phone app is now available as a free download for smartphones and tablets. This latest application allows operators in the field to optimise their combine easily and always have the recommended John Deere settings to hand.